Former batsman Geoffrey Boycott claims "big question marks" remain over England's ability to play spin after India took charge of the first Test. 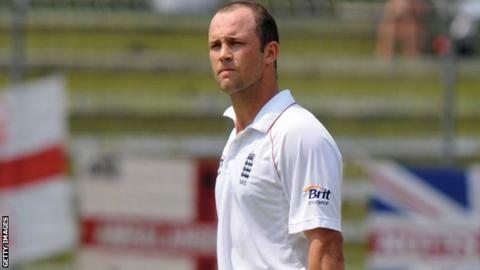 Nick Compton, James Anderson and Jonathan Trott fell in the space of 13 balls late on day two in Ahmedabad. England closed on 41-3, requiring a further 281 to avoid the follow-on after India made 521-8 declared. "We haven't really proved in our mind or in our technique that we can play spin," said Boycott. "You can practise as much as you want, at as many bowlers as you want, in the nets, but when you're out in the middle in a Test match there are four guys round the bat and you're on nought - it's a totally different game. "England must take some blame for sending James Anderson out as night-watchman - simply because it was too long for him to survive. "Twenty minutes or so is long enough if conditions are benign but, with the ball turning, wickets can fall in clusters - which is exactly what happened." "Part of it's in the head. Everything looks alright and suddenly we're three down. "We've had 18 overs of England batting and we're talking about the follow-on, which tells us everything. It's not looking good." Compton made nine on his England Test debut before he was bowled through the gate by off-spinner Ravichandran Ashwin, who had Trott taken at short-leg after night-watchman Anderson fell in similar fashion to slow left-armer Pragyan Ojha. Captain Alastair Cook will resume on day three on 22, alongside the returning Kevin Pietersen. "KP is a super player, Trott and Cook will graft and they've got big hearts," said Boycott, who scored 8,114 runs in 108 Tests for England. "But I'm looking at three decent players and three big question marks. "Compton, a new lad starting his Test career, was bowled between bat and pad - that's not good. "Samit Patel has played well against spinners in the warm-ups but has he done it in a Test match? "Then there's Ian Bell. He was all at sea against the Pakistanis (in the United Arab Emirates earlier this year), and when he goes home there's Eoin Morgan, the left-hander who didn't do too well in the UAE. "We've got two kids from Yorkshire (Jonny Bairstow and Joe Root) - they've never been on tour and never seen it turn like this. "That doesn't fill me with confidence when you're facing 520." Patel, however, believes the remaining England batsmen can help the tourists fight their way back into the game. "We've got two world-class batsmen at the crease, Ian Bell still to come, myself and Matty Prior - a lot of batting," said Patel. "There's no question about how long we can bat. We've got the same potential of batting as India have - and we've got to keep believing that. "We've put in the hard yards; we know what we can do - we're good players of spin. "Tomorrow [Saturday], we hope we can show what we're made out of." India's total was built around Cheteshwar Pujara's unbeaten 206, while Yuvraj Singh made 74 and Graeme Swann finished with 5-144. "Last time I missed (out) and I wanted to score a double hundred," said Pujara, who passed his previous best of 159 against New Zealand in August. "These were the perfect conditions for me." Listen to Jonathan Agnew and Geoffrey Boycott's analysis of each day's play on the Test Match Special podcast.